Continuing her quest to discover the truth of her past, and after spending all of the first issue hunting for Cheetah in Buwunda, Wonder Woman tries to persuade Cheetah to help her find her way back to Themyscira which is, for reasons unknown, somewhere that she can no longer find. At the same time, this latest issue also follows Steve Trevor’s continuing, yet entirely separate, adventures in Buwunda where he is on a hunt of his own, searching for a warlord called Cadulo. Urzkartaga is the root of Cheetah’s problems, as the plant god has always been, and before she is willing to help Diana, Cheetah extracts a promise. Namely, that Wonder Woman will help her to kill her creator. Will Wonder Woman accept? Do you even know who Urzkartaga is? Should you even care? Well, to answer all three points… buy the book to find out! Urzkartaga is a plant god and the source of Cheetah’s powers, and as for if you should care… yes you should! This is all becoming very important to Wonder Woman rediscovering her own reality, and no doubt will play a part in Steve’s hunt for Cadulo. 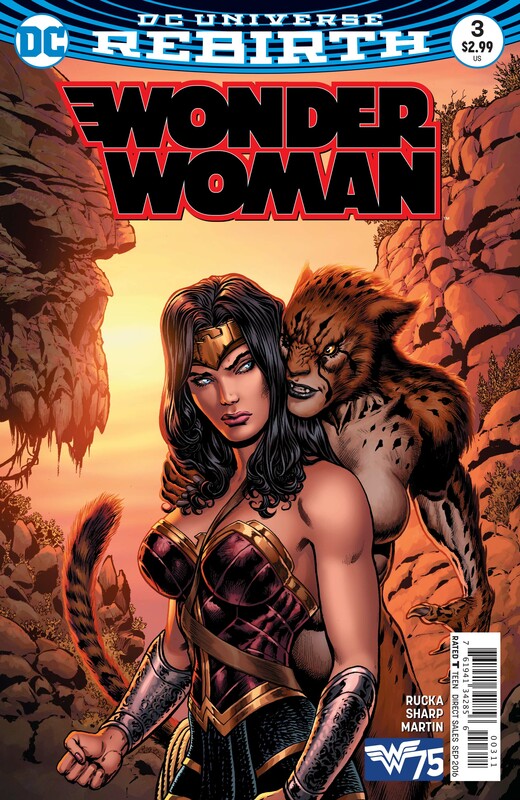 Rucka uses this issue to probe around the edges of the relationship that Wonder Woman has had with the Barbara Ann Minerva (aka Cheetah). Obviously he is unable to go through their years of history, but he does start laying the groundwork for his reimagining of the dynamic between the two. It will be very interesting to see how Ruck brings Wonder Woman and Steve Trevor into confluence, whilst resolving their two not so disparate tales. Liam Sharp’s depiction of Cheetah is, no pun intended, wonderful. She is a raw, fierce, feminine, animalistic power. A goddess. It’s probably the most feral and least sexualised that I have ever seen her depicted, and that’s fine by me. Sharp’s representation of her savage power provides a stark contrast to the majestic, elegant and gracefully potent way he depicts Diana. I also love how some of Sharp’s UK and European influences come through in the way he draws Cheetah turning quickly on Wonder Woman, as well as when she attacks Urzkartaga’s followers. The heavy linework is reminiscent of style you would see in the British anthology comics of yore. It’s unusual in today’s comics, and that pleases my middle aged sensibilities no end. Overall, this is another fine effort from Rucka the world re-builder and Sharp, the drawer of very, very pretty pictures. If, like me, you have no particular history with the characters (I don’t believe that my childhood crush on Linda Carter counts) then you might need to have Google (other search engines are available. It is a lifestyle choice after all) handy to help you through the jungle quagmire that is Urzkartaga lore. But if that’s the only drawback in this interconnected era, then pshwah, that’s no drawback at all. Can somebody please explain me, how come the Goddess of Hunt, supposed to empower Cheetah in the New 52, suddenly turned back to the Post-Crisis Urzkartaga? Giving the fact that Rebirth was NOT A REBOOT, it seems pretty strange to me that nobody (i.e.WW, of course) shows any surprise at this sudden change of the divine empowerment source. Perhaps, it’s because Rebirth is more like a retcon. Still i wonder why nothing is explained at all…. Seems like it would fall under the whole “pre-Rebirth memories stolen by Doctor Manhattan” thing, with Wally West’s return gradually allowing people to recall some of the pre-DC stuff on a person by person basis. Gives DC the opportunity to change some things and keep others as they see fit. It seems to be effecting different people in different ways. Like the Titans and Barry Allen remember Wally perfectly, while – say – Green Arrow and Black Widow only have vague feelings of their previous romance. So I’d guess in this instance WW remembers some of the pre-52 stuff. It’s a bit murky to begin with, but it lets DC effectively pick and choose what aspects of history and continuity to run with moving forwards. No worries, man. Happy to help!